Like we sez, +4 isn't twenty up, but neither is it five down. Q. 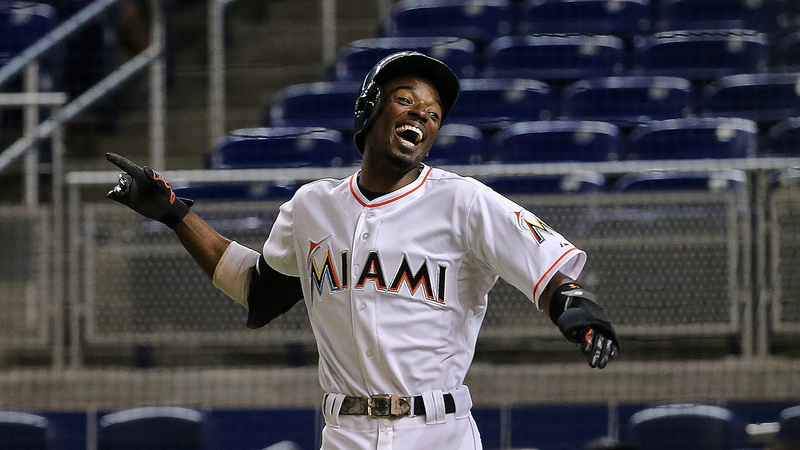 Were Dee Gordon's 4/4 hits earned, or just one of those things? A. Earned with a capital E.
Earlier in the year we wondered about him turning his hip into the pitch and adding power to his game. The Mainframe was hopeful but forced to predict that he'd be forced to revert. Such has been the case. Earlier we were hoping for more, but at this point what we want is the .310/.340/.375 shtick he ran in Miami, preferably along with the running game that nabbed him 60 sacks a year? FIRST HIT. Barrelled it up and socked a single into right-center with a pepper swing. SECOND HIT. Bunt hit, but not just any bunt hit. He stood in the box, not taking off too soon, chopped a bunt down towards first visibly watching the ball hit the bat, and took off at 100 miles an hour at juusssssst the right instant. THIRD HIT. Again squared the ball up for a clean single. FOURTH HIT. They brought in a lefty specialist to face him, who threw a nice jam pitch above the hands and inside, but the fought it off up the middle (nicely timed!) and got a clean ground ball single over second base. I wonder if Dee was a little messed up first half, with swinging too hard and with the toe, but am willing to gingerly predict a reversion to the form of the last four years. He’s got 31 infield hits already and what he does -- ground balls and line drives, with some hits from the legs and 1 WAR's worth of bases from same is not accidental. Why is first half (actually the 2nd quarter) was so dicey is anybody’s guess but here’s hoping it’s over. Actually we notice he’s hitting 287 the last month, albeit with a 310 slugging percentage, so apparently he’s been working it. A little rest for the toe over the ASB may have his basepath game back on track and boom. 4 All-Stars again. Q. What were Boom's 2 RBI? A. A short fly ball to right, that the RF came in on about 3-4 steps. Dee Gordon was on 3B and the man did not even try to throw home. Men on 2B, 3B Cruz laced a hot grounder through the 6 hole, scoring Segura. He's on pace technically for 94 RBI but gaining fast on the 100 mark. If you take just his games played he's on pace for 114. Earlier Matt talked about adjusting the wxOBA stat for running speed and shifts. The lack of infield hits would put Cruz' slugging percentage somewhere between his actual 540 and his theoretical 600, depending on how much you wanted to or just down from 600. Q. What was the third RBI? A. Here's a litmus test for all you "homers" out there. Runners on 1B and 3B, one out, Ryon Healy hit a hot smash that caught the 3B in the gut. Exit velocity and too hot to handle? Or playing the last place team? Judge for yourself and judge your self :-). I put it at 60% too hot to handle; the 3B was playing in some. Your mileage may vary. A. The top of the lineup, 1-6, all had hits and production, while the 7-9 guys were 0-9. I miss the collateral damage, don't you? If you enjoy this article and the Think Tank, you may wish to check out Dr. D’s fundraising shtick. Or if you know you’re ready to join the Ownership Committee, here’s a direct link to the sponsorship page. We're 23% to our goal in just a day or two. Thanks amigos! Can we keep Andreoli up? Apparently not. More Heredia, I suppose. He last had a BB on June 29th, 42 PAs ago. That includes 12 starts, btw. If not Andreoli, maybe Andrew Aplin? .309-.404-.447 in Tacoma has to be worth something? Isn’t that what AAA is for?